Due to today’s dynamic way of how a business is conducted, more employees, customers, vendors and alike are working while on the move and using mobile devices and cloud services to perform day to day business tasks. The need of the hour is to make structured data available with the stake holder that drives mobile enabled communication in a secured manner. Also a system is required for increasing the interaction with mobile users and engaging them in every possible way. 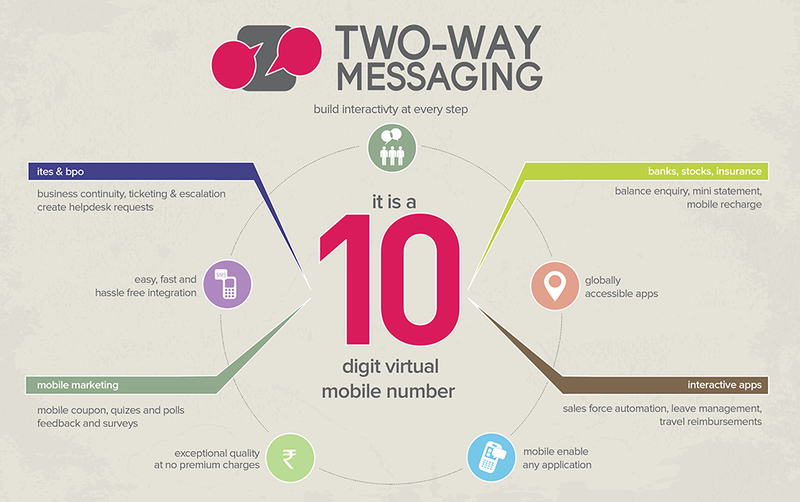 Two-Way Messaging Solutions serves the purpose aptly. It helps Enterprises have a global reach, ensure quality service and a secured mechanism to distribute and access corporate data. The solution brings to you the ease of a web enabled application on any phone and related devices, anywhere and everywhere. This in turn helps in achieving high productivity level, save time, cost and enhance the response level resulting in a rich customer delight. Two-Way Messaging solutions empower enterprises by engaging its community across the globe. The interactivity and the global reach that the solution provides, it helps to engage customers and employees with ease in meaningful interactions in a secured manner. This in turn supports business functions, works as effective PR and accelerates reactions. Two-Way Messaging has proved to be enhancing operational efficiencies and increased interactivity for enterprises when it comes to dealing with customers and employees. . The younger workers who’re used to texting their friends can use Two-way solutions to interact with their colleagues. Two-Way texting is useful in institutions where the employees deal with sensitive or confidential information. Secure texting makes sure that they keep track of the exchange of information while at the same time, speeding up processes. An Indian Retail giant has recently introduced the enterprise texting services to reduce the lead time of procurement and distribution. The Two-Way Messaging system has helped the Retail Giant not only cut the cost, but also create a better response management from their vendor pan India. For eg: if a buyer of a certain category requires any product, he simply sends an SMS from the phone. The message is instantly delivered to all the vendors in the given location. The vendors in turn revert with a text stating the pricing and quantity available. This helps the Retail giant in making a quick comparison and helps him save lot of time and money. The material is procured and delivered at the lowest possible cost with a click of a button. A multinational healthcare organization has enabled enterprise texting to help the doctors and nurses interact with different departments while carrying out their activities. The fact that these messages can alert the recipient as well as the sender as to when it’s been delivered or read makes it that much more easier for them to keep track of responses. For example, if a nurse texts a doctor, she knows when the message was delivered and read. If a doctor is with a patient, he can instantly text the appropriate people in different departments instead of going to a computer and emailing them. Therefore it cuts down processes and delays. Most Two-Way messaging solutions use a short or long code. UNICEL enables Two-way messaging using a a virtual number which is a ten digit number that is accessible to all mobile users across the globe to receive SMS or Voice calls. An Enterprise can have their unique Virtual Number with minimal cost. As for the receiver, interaction via a Virtual Number is highly affordable compared to a Short Code. UNICEL owns to its credit of being the pioneer of virtual number in India. During its decade plus of existence, the company has implemented the Virtual Number solutions across different industries to affect the lives of millions of people on a daily basis. Some of the key business that have successfully applied this solution includes BFSI, BPO services, IT industries, Stock Exchange, Retail etc. Two-Way Messaging Solutions completes your interaction cycle. Responses to mobile users can be initiated via SMS, a Voice call or an E-Mail. Increases interaction: It increases the speed of response since your customers have the option of responding to your messages right away from a mobile phone. This also helps them engage in the activity as soon as possible rather than be distracted by other things. Gives a personal touch to your business: Two-way Messaging allows businesses to stay in touch with customers since it creates a dialogue. This gives business a personal aspect to it. In this day and age when customers feel invisible in the mass labelled as target audience, this is best way to reach out and retain customers. Global Reach: UNICEL Two-Way Messaging Solutions allows users to remain in touch and effective regardless of their location or devices, thereby extending the everyday essential business communication and productivity tools – the need of today’s business. Works as PR for the company: Communicating directly with the customer can complement marketing and PR initiatives by using dynamic, interactive campaigns. Cost Effective: While it is very easy to implement, it is very cost effective too. Two-Way Messaging Solutions offered by UNICEL comes packed with a SaaS based UI which is user friendly and requires less technological know-how. The services can be accessed from the basic mobiles phones available in the market and thus further reduces the cost of smart phone procurement and mobile application development. Ease of Accessibility & Implementation: Since the responses can be initiated via SMS and a Voice call apart from an E-Mail the derived benefits of the solution can be utilised by even a basic mobile phone user. There are no geographical boundaries when it comes to the implementation of the system and the simplicity of the system makes its very user friendly. UNICEL Two-Way Messaging Solutions allows customers and enterprises to interact with each other using UNICEL’s Virtual Number platform. UNICEL allocates a 10-digit Virtual Number, medium code or a short code to enterprises which they can publish to customers asking them to send SMSes. UNICEL hosts these numbers on its virtual number platform. Customers of enterprises who have subscribed to Two-way messaging services from UNICEL can communicate with the enterprise by sending an SMS to these virtual numbers. Enterprises are given the option to configure static or keyword specific auto-responses via SMSes. SMSes received on these virtual numbers can be forwarded to enterprises as an email or an API. The API integration can organize the required internal action and provide a proactive response as an API Echo itself. The entire behavior of the two-messaging can be controlled on UNICEL’s Two-Way Messaging UI that offers a comprehensive business rule creation wizard. The topic of ‘cloud’ has become a hot topic for enterprises as they seek to become more agile in the face of a rapidly changing market. However, one of the biggest areas of enterprise IT spend for which cloud technologies have only started to scratch the surface is in the area of communications. Given the accelerating changes in how workforces and customer bases are becoming more distributed, more mobile, and more demanding, the need for cloud technologies in communications has never been greater. Fortunately this is beginning to change, as many companies have started to focus on how communications can be delivered much more effectively over the cloud, providing greater functionality, flexibility, and value to both enterprises and customers alike. At the same time, given its close dependence on the telecom market more broadly, cloud communications companies have had to face a unique set of technical and regulatory challenges to deliver on their promise. In many parts of the world, the cloud communications market was kick-started through the emergence of Voice over IP (VoIP) technologies Today a wide range of cloud communications companies have emerged to offer highly innovative and easy to use voice-based services delivered over the cloud, with all the requisite benefits of cloud-based delivery models. Through these services, enterprises are able to build call center applications on the fly, send OTPs/codes over voice calls, and integrate click-to-call features on websites, just to name a few common use cases. Over time, these companies have also aggressively expanded into similar services delivered over SMS, USSD, and other emerging platforms as well. All these services have the simple objective of seamlessly providing a wide range of communications options without any of the technical or cost barriers of using traditional telecom services. In India too, the cloud communications market has been a hotbed of activity and in many ways has led the West in terms of its development, though the market has evolved quite differently. Enterprise Messaging, or the more commonly used term ‘Bulk SMS,’ has been the killer application that found almost universal acceptance across industries. Unfortunately, this market was almost too successful for its own good, as ‘use’ turned into ‘misuse.’ This was largely due to regulations that struggled to keep up with the rapidly evolving market, and the famous ‘entrepreneurial spirit’ of the Indian market for exploiting loopholes in the regulatory framework. Fortunately, the tide has begun to change. In the last 2-3 years, the Indian regulatory scenario has seen a sea change with a clear and strict set of guidelines for ‘Do-Not-Call’, along with closing of loopholes that allowed players to circumvent the regulations. Cloud-based voice services, which have languished in India compared to other markets, has seen the emergence of several promising start-ups. Simultaneously, the regulatory sentiment is changing with regard to opening up VoIP services, which should hopefully become a huge enabler of a much richer set of use cases. As we look ahead to the future, we believe that there will continue to be tremendous opportunities for innovation in the cloud communications market in India, and we look forward to being a key player in shaping that future. Welcome and thank you for spending time reading UNICEL’s blog. As one of the pioneers of the cloud communications market in India, we at UNICEL have always felt that we enjoy a unique vantage point of the communications market. Not only do we get the opportunity to hear from so many enterprise customers, we also get to see numerous innovative uses of the technology, we interact with telecom operators on a daily basis to see how they are approaching the market, and we experience the ups and downs of the regulatory environment. With so much going on everyday, we felt launching a blog was the perfect way to both share the learnings from our experience, but also hear back from our readers. We hope you find some of our blog entries interesting as we continue our quest to simplify the lives of mobile users across the globe. Thanks again, and happy reading !